When my sister recently travelled up from Christchurch to the Nelson/Tasman Region, I was able to show her something new. 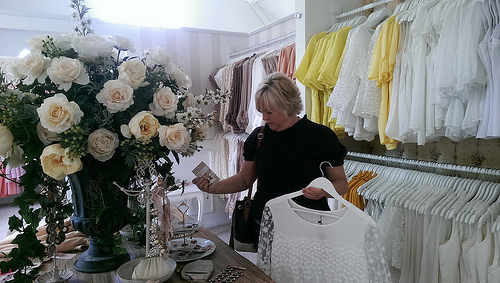 A rather gorgeous shopping and dining trio has been created at Church Lane, Motueka: – The French Store – Vintage Rose Fashion & Baby Rose Fashion – and the Church Lane Restaurant. Chandeliers and soft whites feature in all 3 buildings to create a calming ambiance. Someone here obviously has a vision for creating beautiful spaces. 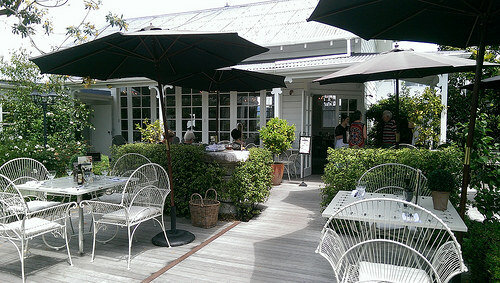 The tables are set well away from each other and the staff wear crisp white shirts and long black aprons to the ankle. The sister looks pleased…. …let’s step outside to the large courtyard..
…this photo shows only a small part of a much larger area. I think it’ fair to say that most people we saw dining here had made an effort to dress up a little. 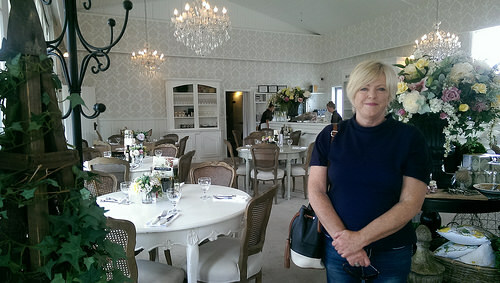 I really like that and although visitors to this country love our casual approach to dining, it’s nice to have somewhere special to celebrate a special occasion or a really long lunch. Now let the shopping begin! 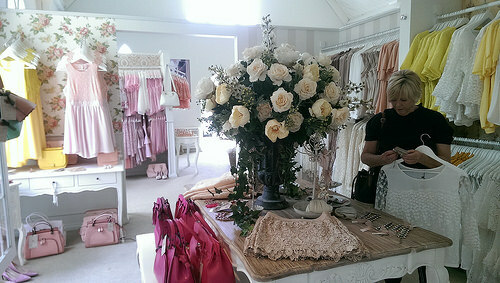 The Women’s fashion at Vintage Rose Fashion is actually housed in a beautifully restored old Gothic church – very spacious. The clothes are incredibly feminine,colourful and rather unique. All items are grouped according to colour. The staff are also gorgeous and they look incredibly happy to be here. Handbags, shoes and jewellery – it’s a one-stop shopping experience (from here you can walk straight on through to Baby Rose Fashion). The French Store further down, lives up to it’s name with beautiful linens, and a surprisingly good range of gifts for men. No soap-in-a-rope here folks! Perhaps I’ll buy Michael that large compass with a handcrafted leather case. 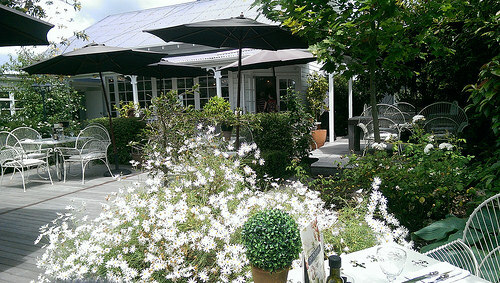 Who would have thought this Motueka shop and dine experience could be found in an area known more for it’s fruit orchards and being the gateway to the Abel Tasman National Park. Keep up the momentum guys.